A young Loretta Claiborne and her six brothers and sisters sat around the dinner table. They weren’t allowed to speak during the meal, but after they finished eating, their mother, Rita, encouraged her children with positive affirmations. She wanted them to know they’d be something, somebody, in a world that often told them otherwise. But for Loretta, Rita’s fourth child, the evening ritual left an uneasy feeling in her stomach. Although Rita’s intentions were good, the experience of sharing goals was Loretta’s least favorite part of family bonding time. Loretta sat and listened as her mother bestowed praise upon her siblings one by one. Her sister Stella was going to excel at anything she put her mind to. For Debbie, maybe a career as a doctor or a lawyer would best suit her. And there was no doubt about Marlena, one of the brightest among them: As long as she kept up with her studies, she was on track to be a leader. But it seemed her mother always hesitated when it came to Loretta — because Loretta wasn’t like her siblings. When Rita was pregnant with her daughter, she fell down a flight of stairs. The fall caused Loretta to be born partially blind and with an intellectual disability. Before Rita could settle on an answer for Loretta, the girl, who was eager to know how she’d fare in life, beat her to the punch. “But what about me?” Loretta blurted out. She had aspired to become an athlete, a nurse, a veterinarian. At that moment, there was no way Loretta could have known that just being Loretta would be the best thing she could ever be. Today, 65-year-old Loretta Claiborne is standing before a group of students in a crowded gym at Crispus Attucks Charter School in her hometown of York, Pennsylvania. This speaking engagement is one of hundreds she has done since joining the Special Olympics, a sports organization for children and adults with intellectual disabilities, in 1970. Since then, Claiborne has made a name for herself as a face of the organization and one of its most decorated athletes; competed in 26 marathons; been a recipient of the Arthur Ashe Award for Courage at the 1996 ESPYS; earned two honorary doctorate degrees; and traveled the world sharing her story, including a TEDx Talk in 2012. She would go on to meet presidents, be honored at several events and have a building named after her in the center of York. “Today, I’m going to talk about the power of voice,” Claiborne says. In the 1950s, children with intellectual disabilities were often institutionalized and lived separately from society. Rita, a single mother who was strong-willed and determined to give her daughter a better life, scoffed at the idea of Loretta being raised differently from her other children. She took Loretta home to adjust to their new lives, which meant caring for a child who would not walk or talk until she was 4 years old. But as Loretta grew older, one of Rita’s largest challenges was splitting time between the seven kids. Nearly all of Loretta’s siblings were involved in extracurricular activities, which left Rita having to choose which events she’d attend to support her children. While she went to the same schools as her brothers and sisters, Claiborne’s disabilities made her a constant target for bullying. She repeated the first three grades. Her classmates would laugh and make fun of her, call her cruel names and pull pranks that caused her to shut down. Her voice, something she fought so hard for, diminished day by day. Claiborne recalls one moment in school when a friend, impressed with her drawing skills, encouraged her to sign up for an art class. She did so reluctantly, hoping that it would help break her out of her shell, but she was verbally attacked as soon as she began. 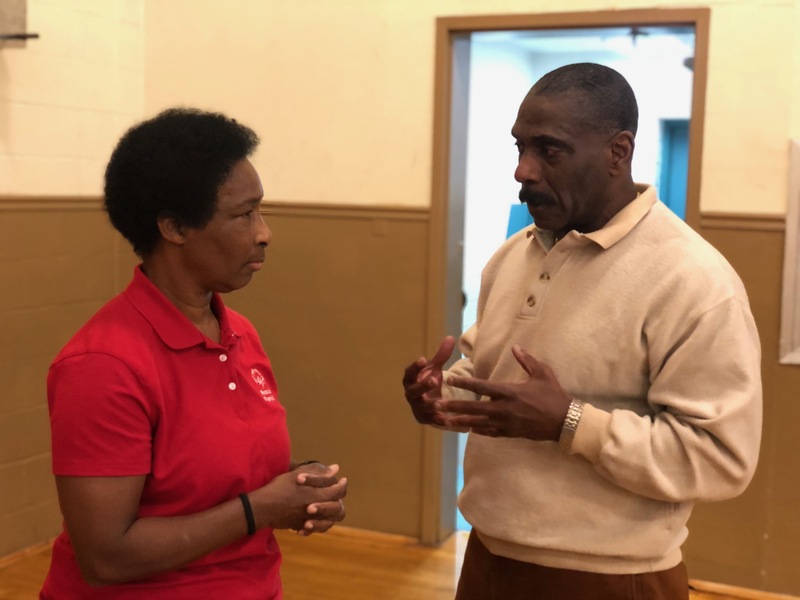 Loretta Claiborne engages in conversation with longtime friend and Crispus Attacks Community Center CEO Bobby Simpson. Simpson led the charge for a building to be named after Claiborne in their hometown of York, Pennsylvania, in 2001. With bullying becoming more frequent, fighting became Claiborne’s preferred form of communication, and that got her into even more trouble. But with the help of running, martial arts and eventually the Special Olympics, she was able to develop effective coping skills. In 1966, Loretta discovered her love for running through friendly competitions with her older brother Hank. Still, her anger lingered. Coaches, mentors and friends constantly reminded her that her feet would take her more places than her fists ever would. As a temporary remedy, Loretta signed up for karate at the behest of longtime friend Bobby Simpson. She soon learned how to channel her anger and aggression, and she worked her way up the ranks to a fourth-degree black belt. Five years later, when Loretta was 18, the Special Olympics found her with the help of Janet McFarland, a social worker turned advocate. McFarland figured the program would serve as an outlet for Loretta. Here, she would meet a community of people who had faced some of the same obstacles she had. She also mingled with mentors and coaches who would become lifelong friends. One of those coaches was Roxanne Dubbs, who has known Claiborne since 1970. As time went on, Claiborne realized the importance of her place in the world. And in 1984, Rita, who had never seen her daughter in action, showed up to the county meet where Loretta would be competing. Rita had just gotten out of the hospital after suffering a heart attack, but was determined to be there for her daughter despite her illness. At the Crispus Attucks Charter School gym, Claiborne continues to engage the students and emphasize the importance of using their voices to create change, as she’d learned to do. Indeed, Claiborne has found the power of her voice — and the power of being Loretta.